Chip for control and acquisition from external read-out IC (ROIC). Designed for use in cryogenic infrared applications. 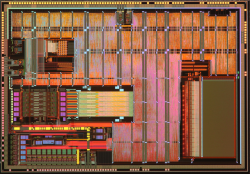 The IDE8411 is a control and acquisition integrated circuit (IC) for large area hybrid imaging focal plane arrays (FPA). It is designed for use in extremely wide temperature ranges, spanning from room temperature to cryogenic conditions (77K), making it particularly suitable for MCT or InSb based FPAs. It integrates the functionality that is usually found in discrete proximity electronics into one radiation tolerant SoC. 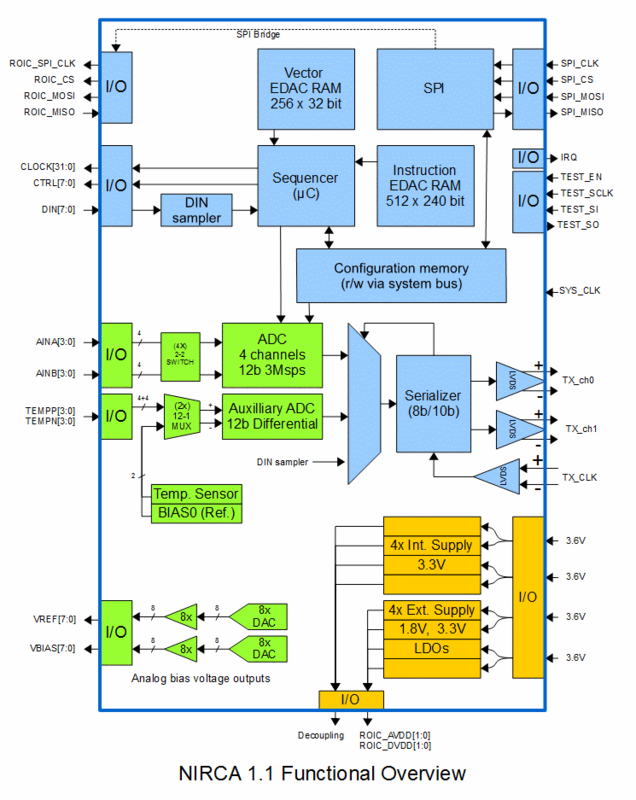 IDE8411 has 5 parallel differential video channels with programmable gain amplifier and 12-bit, 2.2 Msps ADC in every channel. The ASIC contains a programmable sequencer for generation of clock patterns and to control ASIC functions. The sequencer can control 40 parallel 3.3 V digital outputs for generation of custom clock patterns, to read out any 3.3 V compatible ROIC. The clock patterns and sequencer instructions are stored in integrated RAM memories with bit error detection and correction. In addition the IDE8411 has 8 parallel digital inputs that are accessible and can be evaluated using the sequencer. The IDE8411 contains integrated 3.3 V and 1.8 V LDOs for regulation of ROIC power and 16 integrated low noise DACs for bias and reference voltage generation. Internal IC settings are controlled via registers that are accessible by serial peripheral interface (SPI). The SPI interface is used to program the RAM memories with clock patterns and instructions. In addition, slow ADC acquistion can be performed directly via SPI. Digitized image data is serialised and encoded on a 300 Mbps 8b/10b output data interface. The IC is radiation hardened by design as it is implemented in IDEAS custom radiation hard library. In sample quantities, the IDE8411 is delivered mounted chip on board to a carrier PCB to simplify customer system breadboarding.